Spring season has approached and that means Easter is right around the corner. Brighten up your home for less with these easy decorations. Step 1: Start with a clear vase and pour the luster gems. Step 2: Then layer it with the famous Easter green grass. There are many colors from pink to yellow grass, but I went with simple green to add more authenticity to the carrots on top. Step 3: Add the Carrot Deco on top of everything. Step 1: I found a unique basket with different shades of pink, but you can select any color for your basket. Step 2: Add Easter grass inside the basket. This is where I had fun with it and added a different color of grass from pink to yellow. Step 3: I topped it off with these hologram eggs and piled them around the basket. You can also add money or small trinkets. This is perfect to give away for Easter or simply use it as a centerpiece for your home. 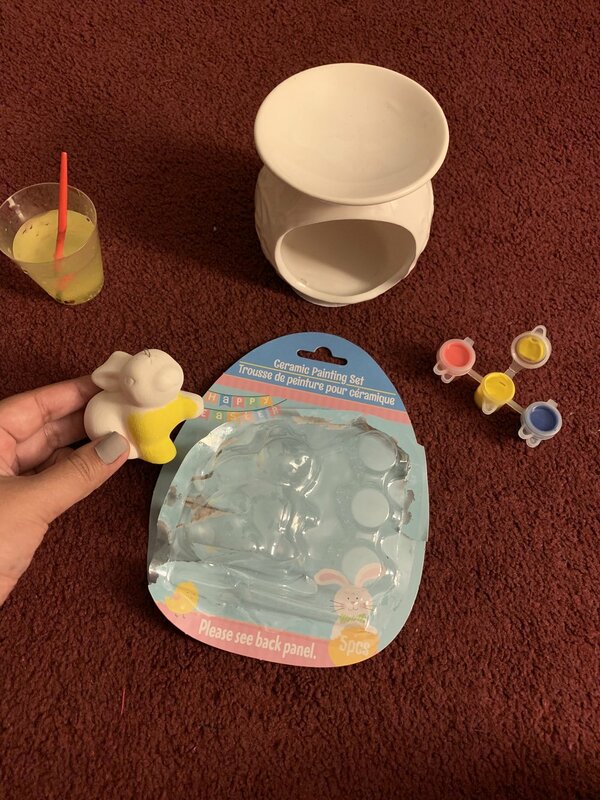 Step 1: You want to start with the bunny painting kit first to let your bunny dry from the paint. The kit comes with three different colors: blue, red and yellow. I chose to paint mine yellow because it seemed more Easter festive. Let it dry. Step 2: I came across this candle tray at the dollar store and I thought I could use it for something. So any type of decor tray you can use to put the bunny on. Step 3: Warm up your glue gun and make sure the bunny is well dried before glue gunning it to the tray and voilà! It’s a cute bunny tray, you can add green grass to it.